Dean Lomax: Elaine, I am so excited to talk with you about the release of your new book Passion in the Bones. I’m honoured to have written the foreword and particularly excited that it’s a dinosaur-themed guide to finding and sustaining your passion. I know first-hand the power and importance of following your passion and unlocking your potential. Elaine Howard: Thank you, Dean! I’m honoured and thrilled that you wrote the foreword! Lomax: Thanks, Elaine. We first met at the Wyoming Dinosaur Center in Thermopolis, Wyoming in 2008, when I was just 18 years old and you were already a well-respected lawyer from Florida. Despite our differences, we made an instant connection based completely on our mutual love of palaeontology. Why do you think that is? Howard: I would have to say it was our shared enthusiasm. We were both extremely excited about dinosaurs and palaeontology and that positive energy drew us together and formed the basis for our friendship. It’s amazing to think about really. Under normal circumstances, a teenager and a lawyer (especially from different parts of the globe) would not usually connect as friends. However, it was that shared passion that broke through any barriers that would have otherwise existed between us. These days, the world tends to focus on the differences between people, but when we focus on our similarities- that’s when something truly amazing can happen. Lomax: Absolutely! That is very true, Elaine. After 11 years, we remain close friends who continue to pursue our passion wholeheartedly. And, you have even written a book about it! Can you explain a little more about why you decided to write Passion in the Bones? Howard: Dean, your passion has taken you from that 18-year-old boy who could not afford to attend university to an award-winning palaeontologist and author and finding my passion transformed my life from negativity and hopelessness to one of excitement and adventure. Our lives- as well as the lives of some of the other amazing people I feature in my book- demonstrate the tremendous and life-changing power in following your passion. I wrote the book to remind people of that and to help them harness that power and use it to live a more positive and fulfilling life. Lomax: That’s fantastic. I’m pursuing my passion professionally while you pursue yours as a hobby. Do you think it makes a difference as to whether someone pursues his or her passion professionally or whether they pursue it as a side interest? Howard: It’s wonderful and so rewarding when someone can turn his or her passion into a career. However, even if you do not make a living at it, your passion can still transform your life for the better. For sure, you and some of my other friends including Sisaundra Lewis and Chris Juergensen, have achieved unbelievable success by following their respective passions. By pursuing her passion for singing, Sisaundra went from a young girl, working in the Florida orange groves with her family, to an internationally known vocalist. Chris Juergensen went from a 21-year-old guitar instructor at a small music school to a renowned guitarist who educates and inspires musicians around the world. Unlike you, Sisaundra and Chris, I have yet to turn my passion into a career but that has not stopped it from transforming my life into an exciting adventure! Lomax: In your book, you mention that I collected Star Wars action figures as a boy and that I sold my collection to finance the trip that launched my career in palaeontology. Yes, this is true! I was amazed to learn that you collected Star Wars action figures as a child as well. We seem to have shared a common passion long before we ever met! Howard: Indeed! When I was a child, I battled academic struggles and low self-esteem, but my love of collecting Star Wars figures helped me handle the stress. I found such delight in saving my allowance to add another figure to my collection. As a young adult, however, I was no longer “into” anything in particular besides planning for my career. I then began focusing on what I felt was missing in my life and, in fact, I was miserable for more than a decade. After discovering my passion for dinosaurs and palaeontology, however, I felt a childlike enthusiasm I had not felt in a very long time. I then began to realize the enormous power in having a passion, which allows us to channel the inner child that many people have let disappear or at least take a back seat in their lives. Lomax: Elaine, what advice would you give someone who wants to find their passion? Howard: First, you need to know what you’re looking for. In order to find something with the potential to change your life for the better, it must be something 1) positive and productive, 2) you’re genuinely excited about, 3) you pursue on an ongoing basis and 4) share with others. In the book, I explain why each of those aspects are important. Once you know what you’re looking for, then you need to begin the process of looking for it. Your true and life-changing passion is like a dinosaur skeleton buried in the ground. You’re not going to find it until you seek it out and uncover it! Lomax: That’s great advice. Speaking of dinosaur digs, we’ve been on some great digs and toured some awesome museums together in the United States. When do you plan to visit the U.K. to fossil hunt and tour the museums we have here? Howard: I love that question, Dean! I’ve been wanting to fossil hunt and visit your fantastic museums in the U.K. for many years. In fact, that’s one of my must-do adventures for 2019! Lomax: I will look forward to it, Elaine! Thanks so much for taking the time to talk with me about your inspiring new book. Best wishes with it! Dean Lomax is an internationally recognised multi-award-winning palaeontologist, presenter and author. He has travelled the globe and worked on many fascinating projects from excavating dinosaurs in the American West, to describing new species of prehistoric reptiles and winning a gold medal for excellence in science. 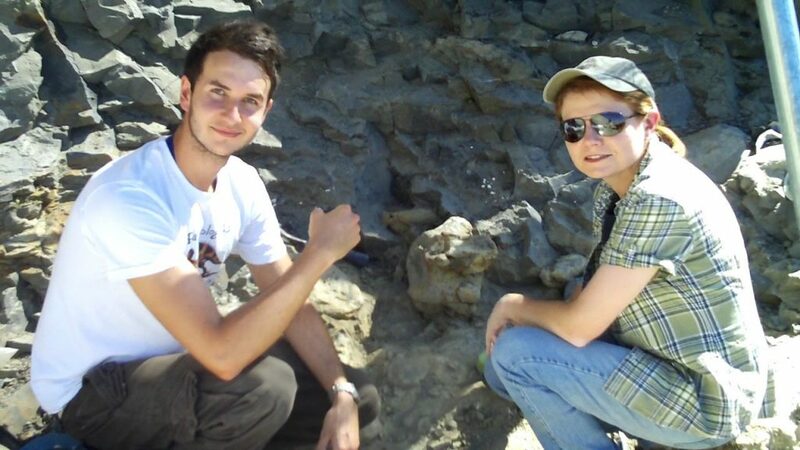 A Visiting Scientist at The University of Manchester, Dean is passionate about communicating palaeontology with the public and regularly appears on television, including as series advisor and expert co-presenter for ITV’s Dinosaur Britain. He has written books, numerous scientific papers, and many popular articles. Dean is also the patron of the UK Association of Fossil Hunters (UKAFH) & Mary Anning Rocks. Passion in the Bones: A Guide to Breaking the Chains of Negativity and Living Your Own Adventure by Elaine Howard is a dinosaur-themed step-by-step guide on how to change your mindset, explore your interests, identify and nurture true passions and share them with others. The book reminds readers that you have the power to enjoy your life and make the most of it, and that passion provides us with a purpose. With foreword by popular British palaeontologist Dean Lomax, Passion in the Bones offers a valuable guide to unleash your personal power and live the positive and fulfilling life you deserve. Throughout this book, Howard reviews case studies about specific people’s passion journeys and how each of them are not only reaping the benefits of their passion pursuits, but also making a positive difference in the world.